PostgreSQL (most people call it Postgres) is an advanced object-relational database management system (ORDBMS). Postgres is an open source database server with more than 18 years of active development which makes Postgres the best choice for enterprise-class applications. Postgresql is cross-platform and runs on many operating systems like Linux, OSX, Windows and the BSD family. It's the right choice when you have an application with large database workloads. Postgres has been used by many large organizations including Yahoo, Instagram, and Disqus. Postgres is also offered as software as a service (SaaS) by e.g. Heroku and AWS (Amazon Web Services). In this tutorial, I will show you how to install Postgres on your own server with OpenSUSE Leap as operating system. Then I will install phpPgAdmin so we can manage our Postgres database from the web browser. The openSUSE repository contains two version of Postgres. In this step, we will install PostgreSQL 9.4 on openSUSE with zypper command. In this step, we will set a password for the postgres user. Postgresql uses a concept that is similar to the Linux user system called "role" for basic authentication and authorization. By default, postgresql creates a new user named "postgres" to manage the postgresql server. Now we will use the psql command. psql is the command line front-end for PostgreSQL, we can directly execute PostgreSQL queries from it. Enter your new password for postgres user. In this step, we will create a new user/role with superuser privileges and create a new database and grant the user access. -s option is used to give the new user superuser privileges. nano is new user name. nano_db is new database name. Now login to the postgresql shell psql and give our new role a password and grant database access. 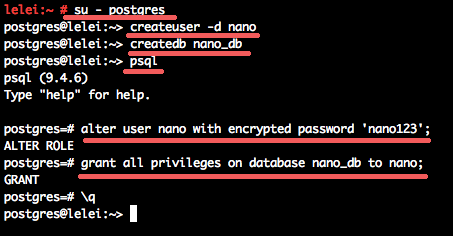 I will use the password '[email protected]' for the user nano here, and grant the privileges to the database nano_db. This user will be used to login to the postgresql from the web based phpPgAdmin interface because we should not allow any default user or user without a password to login to postgresql from the phpPgAdmin. In this step, we will configure PostgreSQL to listen on the public IP so we can access it with DB modeling tools remotely from our desktop computer.You can skip this step if you don't want to access Postgres remotely. Uncomment line 59 and change the value from localhost to "*". Uncomment line 63 to configure the default port. To allow access from the web application phpPgAdmin to the PostgreSQL database, we need to edit the pg_hba.conf file and change some configuration settings. If you want to allow new connections from outside of the server like using PgAdmin3, you can add more "host" records e.g. for the IP of your desktop. phpPgAdmin is a web-based application to manage PostgreSQL databases. It is based on PHP and provides a GUI to manage databases and to create roles. In this step, we will install phpPgAdmin and because it's accessible from the web browser we will use apache2 as the web server. The command will automatically install the dependencies PHP and apache web server. Next, go to the phpPgAdmin directory and edit the configuration file config.inc.php. In the host configuration line 18, set the value to "localhost". If you want to allow a user with name "postgres" or "root" to login to the postgresql with phpPgAdmin, you can set the extra security to false, but it's not recommended to set it false. check the line 93. Login with user nano and password '[email protected]'. 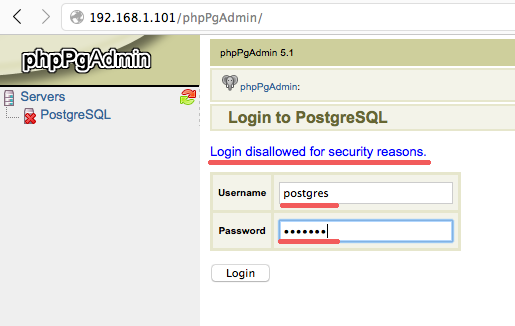 if you log in with user 'postgres' and the correct password, it's disallowed. Up to step 2 it seems to work OK. 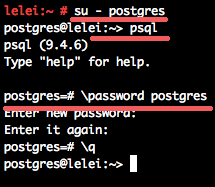 When I get to step 3 and enter su - postgres, it asks for my password. When I enter my password it says "Authentication failure". Am I missing something? I'm sure that I am entering my password correctly. You forgot a step in YaST: You need to enable the service, otherwise PostgreSQL will not be running after a system restart. This was really helpfull, thank you very much!